Shoulder training enhances posture and strengthens the muscles surrounding the shoulder joint. This creates more stability and structure. The shoulder allows for range of movement. When the muscles surrounding the shoulder joint are weak, it can cause injury, immobility and can impair the way you train. If the shoulders are weak then you will struggle with most upper body workouts. When training the shoulders you are also training the deltoids, these are great when in proportion on a physique. The deltoids provide width to the upper body, and contribute to the V-taper physique, due to the waist appearing smaller. Anterior head of the Deltoid. Lateral head of the Deltoid. Posterior head of the Deltoid. The shoulder joint itself is considered as the most mobile joint. It allows for flexion, extension, abduction, adduction, rotation, and circumduction. If you want to achieve your V-shape look, you need to work on the shape and size of your shoulders. This also improves the look and definition of your arms. 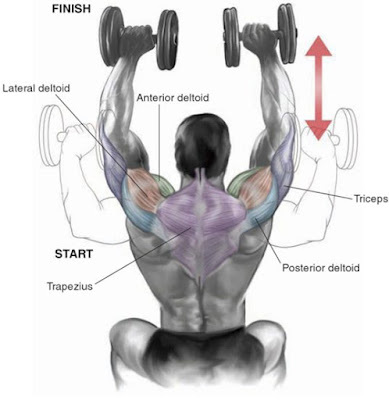 Your deltoids will make the area where your shoulder meets your arm, look more defined and built. This compound movement exercise targets your entire shoulder, but different variations provide enough diversity of movement to make your shoulders even bigger. Using a compound movement will help you gain muscle mass, dumbbell shoulder presses hit both your elbows and your shoulders. Holding a dumbbell in each hand, sit on a bench that has back support. Make sure to rotate your wrists so that the palms of your hands are facing forward. Now, push the dumbbells upward until they touch at the top. After a brief pause at the top contracted position, slowly lower the weights back down to the starting position while inhaling. Stand with a dumbbell on each hand (palms facing your torso), arms extended on the sides. Lift the dumbbells by elevating the shoulders as high as possible while you exhale. Hold the contraction at the top for a second. You can perform dumbbell front raises one arm at a time or both at the same time. 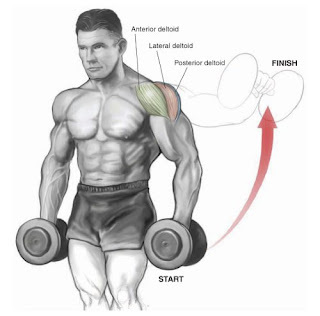 This exercise will give the front part of your shoulders a full look, as well as a round shape. 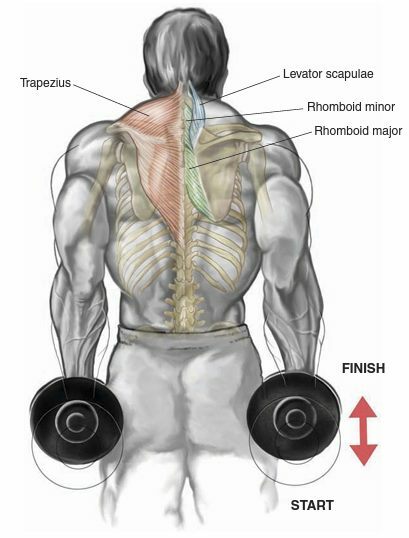 Even though the front of the shoulder is important, don’t forget to focus on the back and side parts. Lift the left dumbbell to the front with a slight bend on the elbow and the palms of the hands always facing down. Continue to go up until you arm is slightly above parallel to the floor. 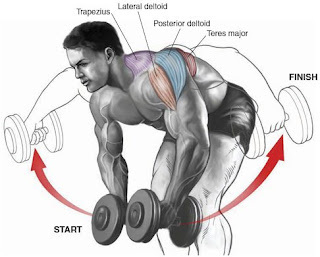 Dumbbell side raises put all of the stress on the outer part of the shoulder, and when you do them with enough intensity over a longer period of time, you shoulders will become wider and rounder, giving you a better V-shape of your body. Pick a couple of dumbbells and stand straight with the dumbbells by your side at arms length with the palms of the hand facing you. 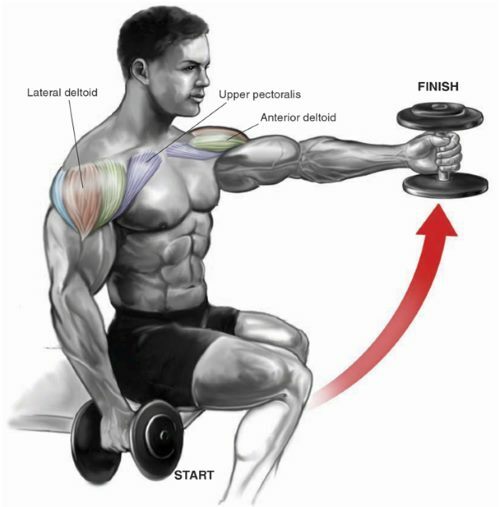 Lift the dumbbells to your side with a slight bend on the elbow and the hands slightly tilted forward. Continue to go up until you arms are parallel to the floor. Rear flyes are just like dumbbell side raises, except you do them bent forward at the waist and the movement is towards your back instead. This exercise is the best one at isolating the rear deltoid muscle. To begin, lean forward with the chest and stomach pulled in. Have the dumbbells in each hand with the palms facing each other (neutral grip). Extend the arms in front of you so that they are perpendicular to your angle. The legs should be stationary while applying pressure with the ball of your toes. Maintaining the slight bend of the elbows, move the weights out and away from each other (to the side) in an arc motion while exhaling.